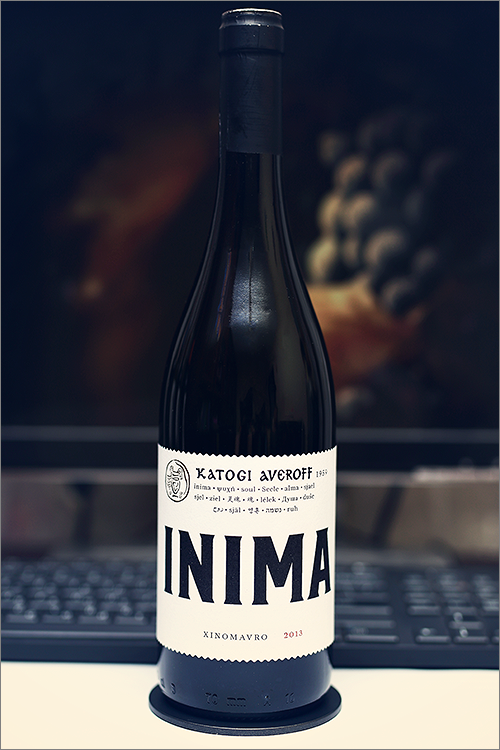 Tonight we are going to review yet another wine from Greece, as we firmly believe that all good things come in threes – Inima Xinomavro 2013 from Katogi Averoff – situated in Metsovo, its vineyards are among the most mountainous in all of Greece, in a place where the seasons of the year move at their own pace and the vines mature slowly. This is a single varietal xinomavro wine from Naoussa region, which is regarded as the ‘Barolo of Greece’. This wine is part of the ‘INIMA’ wine series, which in local aromanian dialect means ‘heart’ and it pays homage to all those who put their heart and soul into making this wine, but enough theory, let’s get straight to the tasting. Noble and transparent ruby color, with hints of copper towards the rim of the glass. The nose is strong, filled mostly with red and black fruit flavours: ripe sour cherry, dried cherry, dried plum, blackcurrant, red apple, red currant, plum jam and hints of blueberry. An instant later comes secondary and tertiary notes of black pepper, sundried red wood, black tea and some nuanced hints of varnish. The wine is dry, with high alcohol level, strong acidity and rough tannin. It feels sharp, austere and fruity, with a very nuanced acidity. In fact this wine is a tannic fruity explosion – aggressive, angular, bitter and tart – all at the same time, therefore off-balanced and rough. The wine has a medium body and a fair overall balance – it feels astringent and fruity adn hot. It has a medium finish and a quite astringent, austere and rough aftertaste. This is definitely a fine Wine of Greece and the overall rating says the same, with 88.7 points scored it is right there, among the best wines we’ve tasted so far. Please click on the chart icon on the left in order to get to the wine rating page, where you can find all the wines we’ve tasted to date. Conclusion: this wine is definitely not yet ready to be uncorked – too young to drink now – tart, rough and austere, therefore 5 to 7 more years of bottle ageing are highly recommended. Its high acidity and aggressive tannins makes this wine the perfect pairing partner for spicy and highly flavoured meals. Our recommendation would be to go with some spicy thai red curry beef or a spicy garlic & rosemary grill steak, as the latter one is simply an amazing wine-and-food pairing. Salut.